Pat Stroud, who as a part-time, mature-aged student was thrilled she could join UDS when she commenced her studies at UWA, involved herself in acting and directing on stage, managing costumes and lights backstage, promoting and marketing, box office front-of-house, as well as being elected to committee positions of treasurer, secretary and president. Deputy Warden of Convocation, Dr Joan Pope, presented Pat with her Convocation Medal at the recent Spring Ordinary Meeting. 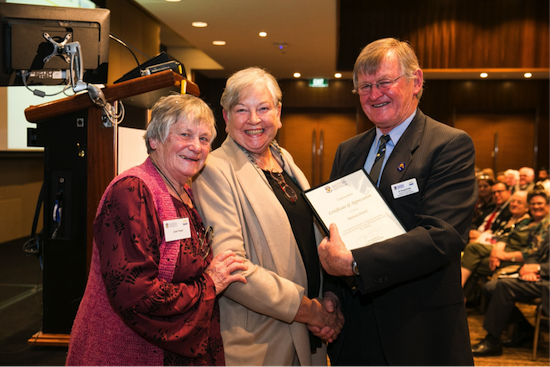 "Pat's interest and heavy involvement in Perth theatre grew from her UDS contacts," Dr Pope said. "She gained production management experiences with John Milson's Purcell's 'King Arthur'; Timothy West's "Women Beware Women" at the Octagon, Raymond Omodei's "Marriage of Figaro" at the Playhouse, and Geoffrey Gibbs’s “The Sound of Music" at His Majesty's Theatre. After completing her Bachelor of Arts degree, majoring in Renaissance Literature and Theatre Studies, Pat continued a similar range of honorary duties with GRADS, the Graduates Dramatic Society. "Through GRADS, Pat quickly became part of the amateur community theatre in many capacities: elected honorary secretary for the Independent Theatre Association Inc., she was responsible for the production and distribution of the monthly newsletter, ITA Link, and volunteered for major tasks with the Annual State Drama Festival and the Annual Finley Award nights," Dr Pope said. "She was assistant administrator, York Theatre Festival, for the UWA English Department, administrator for Children's Activities Times Society (CATS), artistic director for the 'Plays Plus Players' Theatre Company Inc., and founded Omnibus Productions." During the 1990s Pat was a presenter-broadcaster for University Radio Arts program on 6UVS-FM with Rita Clarke, a former Convocation Councillor, and also provided theatre reviews and interviews with RTR-FM for "Artbeat" and "Wavelength". Reading and recording books for the WA Blind Association, last year Pat was recognised for her 30th year of recording books for the vision impaired, and awarded second place in the inaugural National Audio Book of the Year Award for her presentation of Elizabeth Jolley's book 'Sugar Mother'. "In this year, the centenary of UDS, Convocation congratulates one of its members with this presentation of a Convocation Medal," Dr Pope said. "Pat has been an outstanding contributor to the theatre and the arts, and this award recognises the wonderful work she has done."